There's one that allows you to fly from Vancouver to South Korea, and then to Taiwan, and then to Japan, and back home, using non-stop flights the entire journey, for just $791 CAD roundtrip including taxes. There's another one that allows you visit both Taiwan and Japan for $665 CAD roundtrip including taxes. This journey does have 1 stop on the way to Taiwan. The rest of the flights are non-stop. As a variation, you could also try the following, which allows you to fly into Taipei, Taiwan instead of Kaohsiung. Doing it this way also means you would have non-stop flights the entire journey. But you would still need to get from Taipei to Kaohsiung to catch the flight to Tokyo (there's a high speed train, it takes about 90 minutes). Try the same dates from above. Doing it this way also seems to bump up the price by $100. This journey has non-stop flights the entire way. 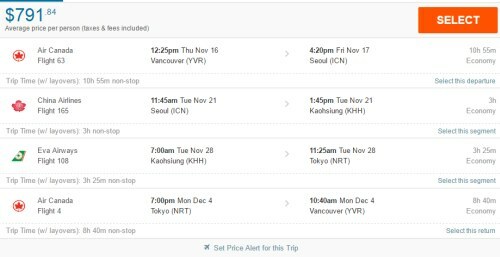 vancouver, yvr, flight deals, taipei, taiwan, tpe, asia, east asia, tokyo, japan, hnd, nrt, seoul, south korea, icn, kaohsiung and khh. 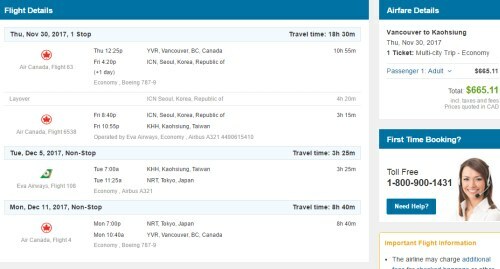 No Responses to "Multi-Country Trips (Vancouver to South Korea, Taiwan, Japan) - $665 to $791 CAD roundtrip including taxes"